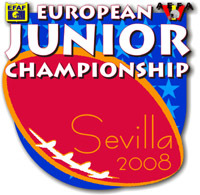 The American Football European Junior Championships will take place at Sevilla / Spain from July 12th till 17th. The Championships will be organized by the AEFA - Agrupacion Espanola De Futbol Americano (www.aefaweb.com). The official website www.ejc2008.com is online.